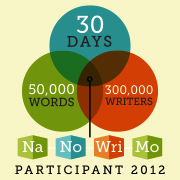 This entry was posted in Writing Path and tagged edit, NaNoWriMo, procrastinate, writing. Bookmark the permalink. Yay! Another person I know NaNoing. I added you. :) I know lots of people that go into November with less than an idea, and just bang it out. You’re in good company. I have less done on my outline this year than I like, personally. But with the help of the forums, the write ins, and plain stubbornness I suspect we’ll both turn out just fine.